Looking for graphic design books? Biblio.co.uk hosts hundreds of of the finest online book stores and booksellers, including specialists in graphic design. Use the list below to locate a specific specialist bookseller or book store near you. Or, use the form below to search the inventory of all booksellers who specialize in graphic design. Oak Knoll Books was founded in 1976 by Bob Fleck, a chemical engineer by training, who let his hobby get the best of him. Somehow making oil refineries more efficient using mathematics and computers paled in comparison to the joy of handling books. Oak Knoll Press, the second part of the business, was established in 1978 as a logical extension of Oak Knoll Books. Oak Knoll Books is a thriving company that maintains an inventory of about 20,000 titles. Our main specialties are books about bibliography, book collecting, book design, book illustration, book selling, bookbinding, bookplates, children's books, Delaware books, fine press books, forgery, graphic arts, libraries, literary criticism, marbling, papermaking, printing history, publishing, typography & type specimens, and writing & calligraphy - plus books about the history of all of these fields. 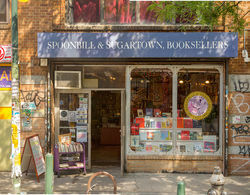 Since 1999, Spoonbill's storefront Brooklyn New York shop specializes in used and new books in the Arts and Letters but is also swayed by incoming collections so that the tenor of its holdings is always changing.